Cory writes about overpasses and tunnels designed to let animals tranfer themselves – and their genes – across highways from Yukon to Yellowstone. This is not news here in Norway – we have had "moose bridges" for years. They are a standard feature of all highways leading out of Oslo, as well as across the high-speed train to the main airport. The design is less ambitious than that visualized at Boingboing. We don’t do underpasses, since Norwegian moose won’t use them (whether US critters are less discerning remains to be seen.) As for using barbed wire for capturing fur…, well that is going to be a real motivator for sexually adventurous animals, isn’t it? 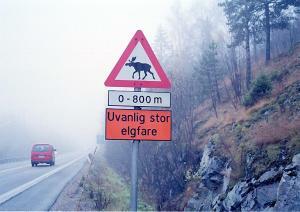 Anyway, the motivation for the bridges here in Norway is much simpler: Avoiding collisions between moose and cars. A moose can weigh in at 550 kg (1200 lbs. ), and has long, thin legs which elevates most of that mass to just the perfect height for entering your car through the windscreen. Which reminds me of a little anecdote: When I moved to the US in 1990, I had to sell my SUV, a Mitsubishi Pajero (1987 model). I advertised it, and it ended up being bought by one of my business school colleagues. I was a little uncomfortable selling the car to a colleague – not that there was anything wrong with it, but if you sell it to someone you know, you take on a bit more responsiblity, at least morally. Anyway, I moved to the States, then came back home for a holiday a year later. Visiting my old place of employment, I was walking through the main hallway when I heard my colleague shouting "Espen, Espen!" and literally running towards me. My neck hairs came up – was there something wrong with the car? He had been teaching a course at a branch campus outside Oslo in January. On his way home in, he had decided to take a short-cut using a dirt road through the forest. And as he came round a bend, he ran smack into a bull moose that nearly totalled the Pajero. But since the car was high off the ground and frame-built, it absorbed the impact in the front rather than with the windscreen, and my colleague was not hurt. If he had had a normal car, he said, he would almost certainly have been killed. "What a car, what a car! ", he exclaimed, again thanking me profusely. As he walked off, my heartbeat slowly returned to normal, and I thought it was a good thing I had kept quiet and not pointed out the obvious: If he had had a normal car, he would never have taken that shortcut in the first place…. Incidentally, here’s a page, in Norwegian, explaining about moose bridges. As for the moose signs, one of the problems with them is that tourists – particularly Germans – like them and steal them as souvenirs. So now you can buy them at all the tourist shops. This entry was posted in Notes from a small country on May 26, 2006 by Espen. One third of the traffic referrers to the Washington Post web site is from blogs. Blog that, says Jeff Jarvis. So, I am blogging it. And it is pretty important, actually. Update: See comment from Jeff below. This entry was posted in Blogging on May 24, 2006 by Espen. I gave a talk today at the European Business Schools Librarians’ Group Annual Conference. The title was "Get on the Net so I can link to you: Academic search and findability in the age of Google," the slides are here (PDF. 2.8Mb), and the (17Mb, 37 minutes, mp3) podcast is available here. This entry was posted in Academically speaking on May 19, 2006 by Espen. My latest essay in ACM Ubiquity is called "The waning importance of categorization" – and deals with the impact on those who categorize when information becomes infinitely searchable. Not unlike Kevin Kelly’s latest article in New York Magazine, though I deal more with the near-term changes. The main point is that, just as mobile phones made us substitute communication for planning, digitally searchable information will make us search rather than categorize. This entry was posted in Digital reflections on May 16, 2006 by Espen. Apple is just Microsoft with a sense of style. IBM is a disaster-in-the-making. Big Blue as a total enterprise is running primarily on customer inertia and clever advertising, which definitely isn’t enough. His point is that IBM and Microsoft have increasingly obsolete business models which will be disrupted as Google comes along and basically organizes the Internet by slicing off the important part of the infrastructure package (that is, the one that is changing) and monetizing it by lots of small ads rather than large and rather opaque licensing and service contracts. And there, of course, he has a point. Except, of course, that Microsoft and IBM have changed in response to external pressures before, and should by no means be counted out yet. This entry was posted in Nerdy ruminations on May 14, 2006 by Espen. Great video of how Wal-Mart has spread – showing the economics of geography and logistics. Via Tyler Cowen, who also links to explanations for the growth pattern. This entry was posted in Business as unusual on May 12, 2006 by Espen. 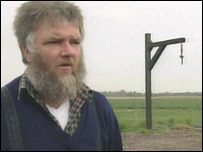 The BBC report about a UK farmer exporting gallows to Africa is making the rounds in the blogosphere. I personally find this a little hard to believe – not from the concept itself, but the pricing: Isn’t £12k a little much to pay for a few beams of oak and some metal? Especially if you are a cash-strapped African country (though the regime may have the money) with occasionally inadequate transportation? I would think that if anything could be manufactured locally, this could. As for £100,000 portable "execution systems", I suspect a hoax here….even though this is from BBC. This entry was posted in Amazing on May 12, 2006 by Espen.